August brought to the fore a number of race-related issues in South Africa. Much of what happened in August, and continues to this day, is hardly new nor surprising. To me, August represented a juncture at which conversations about race became more pronounced, albeit for various reasons. One could argue that it all started in January when a groundswell of disgruntled students sought to bring down the statue of British imperialist, Cecil John Rhodes (not to be confused at all with the "beloved" Zimbabwean lion, Cecil, who was rather unfortunately named after him!). Far from! Indeed, those who have and continue to experience racism in South Africa would tell you that the public protests are simply an outward and more public manifestation of what South Africa battles with: A system and culture of racism, so deeply rooted that protests alone cannot fix. There are many and varied reasons as to why, despite the supposed demise of apartheid, plus ça change. Every month acts of racism, some violent, others less so, but still equally damaging are committed. But unlike the stories, racism isn't a monthly visitor or an occasional unwanted annoyance. The default in many countries is still one of racism. Thus, speaking of racism as "incidents of racism" (as is so often done in mainstream media) ignores that racism is a pervasive, deeply entrenched and systemic scourge. By reducing racism to incidents, we isolate it in people's minds to a point where people ignore that these "incidents" are not isolated, they are manifestations of the norm. The way in which racism has been normalized is best exemplified by the existence of enclaves of racism such as Kleinfontein and Orania, and the continued stratification of institutions of learning according to race (and class - which in South Africa largely remains racialized.) Because it is so "normal," people fail to see it is problematic that there are still schools and spaces primarily for specific races. It isn't regarded as peculiar when a person refers to the school they go to as "white" (and not in reference to the color of the buildings) or for people to seek to explain why a black principal is unacceptable at a "colored school." That universities like the University of Pretoria (Tuks) have "white residences" shows that the system & structures remain racialist. Certain spaces remain the preserve of a certain race. Thus when two Tuks students dressed in blackface, the first line of defence was unsurprisingly that the party they were at was private and "in a white residence." Similar commentary emerged when students at the University of the Free State videotaped themselves degrading black university staffers. Even when not saying it to excuse racism, those who do, are saying racism is acceptable if it occurs in spaces reserved for racism. The result is that society continues to nurture a culture of racism. However inadvertently. At the same time, when students call to question a university's language policy, the normalisation of racialised oppression is what makes a radio DJ feel justified in arguing that black students should rather not go to universities where Afrikaans is the primary language. Such a stance not-so-subtly implies that should you experience discrimination there, you somehow deserve it. This reinforces views that certain spaces are "white only" as apartheid sought to entrench. We cannot be, whether unintentionally, telling people to just stay away from racist spaces instead of seeking ways to address the continued culture of racialism and discrimination. Doing so ignores the fact that in South Africa, as is the case in many other countries with a hugely racist past (and present), we should ensure that institutions are not glowing bastions of that past. Whether intentionally or inadvertently, universities like UCT and Stellenbosch have managed to institutionalise racism in a way that almost seems intractable. One need look no further than faculty composition. 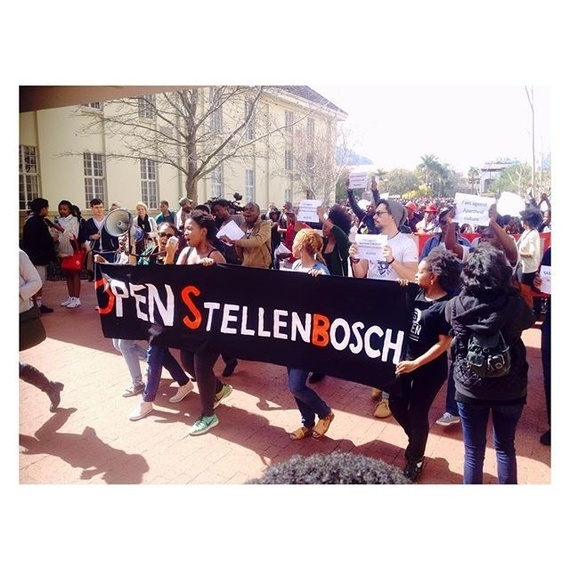 Without taking much time to reflect and introspect, and even less time to listen to the concerns of students, the University of Stellenbosch initially chose to distance itself from mounting evidence of racism. In an attempt to whitewash and downplay what is a serious issue, the University argues that it is transforming. In Parliament, the University indicated that by 2020 it aims to have a student-body comprising of more than 50% "all other races that aren't white" (my words, not theirs). In a country where the white population is hovering at just under 9% it is incredulous that the institution refuses to recognise that its student composition is terribly skew and do something about it. Now. If students argue that language is at the heart of the issue, listen. If students tell you that the culture of racism is why non-white students don't make your institution their first choice, listen. Importantly, when students who did choose your institution in spite of its reputation as racist allege discrimination and ask for you and the world to listen, listen. It seems though that asking others to listen is a tall order. Instead, some Stellenbosch students chose to rather listen to Black Eyed Peas' "Where is the love?" and mute out the voices of those who are not feeling it. Well-meaning as they might have thought they were, these students sought to silence criticism of racism against Stellenbosch by seeking to show the world that somewhere deep in the doldrums of some people's hearts there is love. More than anything, this came across as an effort to absolve themselves of the growing allegations of racism. The week before, in a speech at the University of Cape Town (where the Rhodes Must Fall movement began), Democratic Alliance (DA) leader Aloysias Mmusi Maimane urged those present, and by extension the many of us listening in, to acknowledge that the fight against apartheid was not a fight against people, but against a system. But who created the system? Who nurtured it and ensured its longevity? Systems do not organically create themselves. Apartheid laws did not draft themselves. The architects of racism, whether we like it or not, were people. At the same time Maimane spoke of his party's vision of "inclusiveness." While in an ideal world this is conceptually sound, in South Africa, "inclusiveness" (as articulated by Maimane) seems less about redressing the structural & socio-economic imbalances wrought by apartheid, but more about blindly singing "Kumbaya" and little change. Sian Ferguson perfectly articulates why such efforts are problematic. She points out that, "too often, we shut down debate on important issues because we see them as spreading negativity instead of ADDRESSING negative experiences. Those negative experiences are a result of structural racism, [obviously]. And we know that not talking about racism doesn't make it disappear. It's easy to 'be positive' when structural oppression benefits you." Put simply, she adds, "The truth is that being 'positive' doesn't solve everything. And when that mindset is used to avoid engagement, it's incredibly harmful." 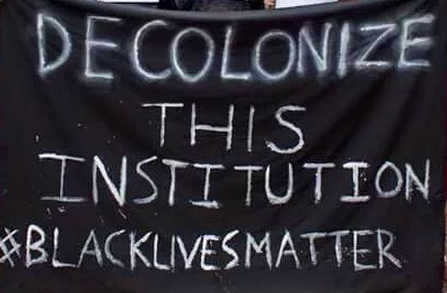 By its very nature, systemic racism is not limited to one institution or even one category of institutions. Indeed, racism exists across sectors. For example, 21 years following the supposed end of apartheid, certain sports are still being kindly asked to have some people of colour in their teams (a 30% quota). In a country where over 91% of the population are not white, one would assume or at least hope that national sports teams would reflect those demographics. The reasons why this isn't so are multi-faceted, but what cannot be ignored is that efforts to address the problem are - at best - lacklustre. It cannot be denied that structural & systemic issues wrought by a history of racism can't be "solved" by occasional window dressing and tokenism, and that this should in fact be rejected. However, nothing speaks to the absence of real efforts to transform spaces than a South African rugby team with smatterings of brown.